IDF says it destroyed the home of the terrorist who murdered a baby and young woman - the evidence says otherwise. 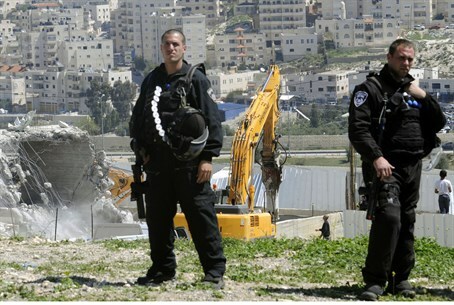 The IDF reported on Wednesday morning that following Prime Minister Binyamin Netanyahu's orders, the home in Jerusalem's Silwan neighborhood belonging to the Arab terrorist behind the lethal October 22 car attack was demolished - that appears to be only partially true. The terrorist, Abdelrahman Shaludi, plowed his car into pedestrians at the Ammunition Hill light rail station in Jerusalem last month, killing three-month-old Chaya Zisel Braun hy''d and 22-year-old Karen Jemima Mosquera hy''d. Shaludi was killed as he tried to flee the scene. Photographic evidence of the home that reached Arutz Sheva reveals that instead of destroying the entire building that belongs to Shaludi's family, an act security sources have called for so as to restore deterrence against terrorism, only a small portion of the building on the third-floor was destroyed. Apparently only the part of the building where the terrorist's personal room was located was destroyed with the rest left intact, enabling the family to rebuild the demolished part easily and quickly. In the demolition order, it was written that the apartment where the terrorist lived was to be destroyed, leaving open the possibility that only the area where Shaludi lived - namely his room - was slated for destruction and not the building of the terrorist's family. During Shaludi's funeral, his mother praised him as a martyr, saying he had given honor to the family, and repeatedly saying "praise to Allah." The lackluster demolition brings to mind other cases of precedent, such as the demolition of the home of the terrorist who murdered police Chief Superintendent Baruch Mizrahi hy''d in April. In that case too only a small part of the home where the terrorist lived was destroyed. The US has criticized the demolition of terrorists' homes, leading to doubts as to whether Netanyahu will carry through on his promises Tuesday night to destroy the homes of the two Arab terrorists who committed the lethal attack that morning on a Jerusalem synagogue in Har Nof. Aside from the homes of those two terrorists, there are another three apartments of terrorists slated for demolition over attacks in the past three months that have yet to be destroyed. The partial demolition raises doubts as to whether the act delivers its intended message. In announcing the demolition, the IDF wrote "the destruction of the homes of the terrorists is a sharp and clear message to all those seeking to harm Israeli citizens and security forces, which says terror and attacking innocents has a steep price that will be paid if they choose to continue these acts." "The IDF will continue to act in accordance with the orders of the political echelon...and will not hesitate to take steps through all the legal means standing at its disposal to harm terrorists and those aiding them, and to deter against additional attacks," concluded the IDF statement. By contrast, Egypt seems to have internalized the concept of deterrence, as it is currently expelling Gaza residents and blowing up their homes with dynamite and bulldozers to create a buffer zone on the Sinai border following several terror attacks.